Once Sage Durvasa (well known for his short temper) offered a floral garland to Indra - the Lord of Devas. Indra did not pay attention to the garland and placed it on one of the tusks of the elephant on which he was mounted. As per its nature, the elephant took out the garland and trampled it under its feet. Sage Durvasa felt insulted at this action and became furious. Durvasa felt that it is because of their power, Indra and Devas disrespected him, so he cursed them to lose their power. The curse of Durvasa started working and Lord Indira including the Devas started losing all the battles against their dead enemies i.e the asuras. Finally the demons led by Bali too control of the Indraloka - the abode of Indra and the entire universe. Indra and the Devas who lost their throne / seats became helpless and approached Lord Vishnu for help. Lord Vishnu gave them a solution and He asked Devas to churn the milky ocean ('ksheera sagar' in Sanskrit) with the help of asuras and extract the Divine nectar named 'Amritam' from the depths of the ocean. On consuming this nectar, the Devas would not only regain their lost power but also make them immortal. Devas approached the asuras and sought their help for the mighty task of churning the milky ocean. Initially, the asuras refused to help their rivals but finally agreed when Devas promised to share the Divine nectar. Finally, they set for the mighty task of ocean churning or samudra manthan. They requested Mount Mandhara to stand as a pole for ocean drilling who agreed. Then they sought help from Divine Serpent Vasuki who too agreed. As they started the churning, the mountain started sliding to the depths of the ocean. It was difficult task to hold the mountain while churning. So, a support are required at the base to uphold the mountain from sinking. And lo!, Lord Vishnu Himself took the form of a gigantic turtle and incarnated as Kurma Avatara to support Mount Manthara on the hard shell of His back. Snake Vasuki was tied round the mountain which was placed on the hard shell of Kurmam / turtle. Thus, started the mighty task of churning the milky ocean. The head of Vasuki was held by the Devas while the tail was held by the asuras who started the process of churning it round the mountain. For the first few churns / twists, snake Vasuki got tickling sensation in his stomach and thus vomited deadly poisonous. The fumes of the poisonous 'halahalam' as is called in Sanskrit, started diffusing in all the worlds spreading high levels of air pollution. There was a threat to the existence of mankind and everyone got terribly scared. Nobody could dare to stop the spread of the deadly fumes. Lord Shiva proactively plunged into action and engulfed 'halahala' to save the universe. Parvati Devi (wife of Lord Shiva) who was watching all these, got panicky at the action of Her husband. By the time, the poison reached the neck of Lord Shiva. She immediately placed Her palm on the neck and with Her Divine (yogic) power, she stopped the further spread of the deadly poison into His body. And lo! His neck turned dark bluish in color with the accumulation of poison. Thence, He got the names of 'Halahaladhar' i.e one who holds 'halahala' and 'Neela Kantha' i.e the one with a blue-neck. What next? The task of drilling the ocean went on smoothly and many treasures hidden in the depths of the ocean were extracted during the process. Each of the valuable item was taken by each of the Devas and Asuras as per their liking and taste. The valuables include 'Kamadhenu' - the Divine cow that fulfills wishes, 'Uchchaishwam' - the white horse, 'Airawatam' - the white elephant which was possessed by Indra, 'Kalpataru' - the magical tree that fulfills wishes and other treasures. It was dark night and Amavasya (no moon day) was round the corner. Suddenly there was a dazzling light accompanied with melodious 'cling cling' rhythms of anklets. Devas and asuras who were deeply involved in drilling, got amazed at the dazzling light. They wondered what could be the reason for this dazzling light. And Lo! Goddess Lakshmi with Her beautiful smiling face, dressed in wonderful silk sari and bedecked in glittering gold ornaments emerged out killing the darkness of the night. The day is celebrated as Dhanteras or Dhana Trayodasi by Hindus. Everyone prostrated to Her except Lord Vishnu who was awestruck / amazed at Her beauty. And He took Her to His wife on the auspicious day of Ksheerabdi Dwadasi.. As Goddess Lakshmi evolved from the depths of ocean, She is considered as the daughter of Samudra i.e the Ocean God. The science behind the emergence of Goddess Lakshmi is that She is considered the Goddess of Wealth and ocean is a treasure trove. There are immeasurable treasures hidden in the ocean including oil. If these are discovered, extracted and used in the right way, a country can have all the riches. And then emerged a beautiful spherical ball like structure which shot up and became the natural satellite of Earth. It was non other than the moon itself. As moon is considered as the younger brother of Goddess Lakshmi (whom Hindus consider as Mother), he is popular by the name 'Chandamama'. In almost all the Indian languages, the word 'mama' refers to 'uncle'. Finally, Dhanwantri (father of Ayurveda) came out with a golden vessel of 'Amrit'. And within a blink of an eye, the asuras snatched the vessel from him and ran away. Devas were at a helpless situation and as always approached Lord Vishnu. In view of tricking the cunning asuras, Lord Vishnu incarnated as a woman named 'Mohini' and approached the asuras. 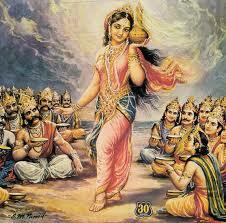 The asuras got attracted by the beautiful Mohini and acted to Her tunes. Tactfully, She took the vessel, magically created two vessels out of it and made Asuras and Devas seated in two different rows. She started offering original Amritam to Devas and adulterated one to Asuras. Two asuras named Rahu and Ketu noticed this. They disguised themselves as Devas and stealthily stood in the Devas row. By the time it was noticed by Surya and Chandra grahas (Sun and Moon) who alerted Mohini, it was late and the Asuras had already consumed 'amritam'. Within no time Mohini transformed into Lord Vishnu and threw His Sudarshana Chakra - the Divine Disc - at the asuras which separated their heads from the bodies. But 'amritam' already had its effect on the head region and the heads of the asuras did not perish but remained alive. As Surya and Chandra were responsible for such a condition of Rahu and Ketu, from time to time, the asuras take revenge on these two celestial bodies (Devas) by engulfing them. However, Sun and Moon come out of the neck region after passing through the mouth and throat. At this time, it is eclipse for the celestial bodies. It is solar eclipse occurs when Sun is engulfed while it is lunar eclipse when Moon is engulfed.